Some saw it as a power grab when Edith Wilson kept Vice President Thomas R. Marshall from seeing the president and preventing the constitutional transfer of power. But Edith believed the doctor’s warning that any stress would kill her husband. To keep her husband alive, she would have to shield him from the world—and that meant running the country herself. Edith’s participation in the Wilson White House gave her—a woman, who just four years before had been a widow living alone in Washington—the capacity to deal with the demands of running the United States while nursing her husband. The impact of the president’s death was profound and broad-ranging: domestic problems were on the rise; foreign policy initiatives ground to a virtual standstill; and the League of Nations, first proposed by Wilson, failed to get approved. At a point, the White House had begun to cease to function. Edith Wilson, a woman with only two years of formal education, had to step in. She had to make it up as she went along, approving appointments, making foreign policy and domestic policy decisions, orchestrating the cover-up, and restricting access to her husband, who at times was totally “gone.” When looking through The Papers of Woodrow Wilson, one is struck by how much correspondence from 1919 to 1921 was directed toward Edith. She was on the front lines of issues ranging from the recognition of diplomats to America’s entry into the League of Nations. Americans wouldn’t see their president for five months. Appointments remained unfilled and correspondence piled up. Years later, essential communications to the president that had never been opened in the White House were found in the National Archives. Like someone who didn’t have time to get to her bills, Edith had simply thrown them in a pile. The cover-up has persisted to the present day; in part, because of Edith Wilson herself. In her memoir, written in 1939, she called her presidency a “stewardship,” effectively downplaying the true significance of her role. But historians have been complicit in the cover-up, as well. While many concede that Edith Wilson was almost the president, they also insist that Woodrow Wilson remained in charge. And while some go so far as to claim she acted as president for six weeks, at most, they go no further in acknowledging the extent of her presidency. Many Americans are still surprised to learn that President Wilson suffered a massive stroke while in office, but what they find totally inconceivable is that his wife, Edith Wilson, was the acting president for almost two years. To acknowledge this would be to diminish Woodrow Wilson’s legacy. Power is given to those who can wield it, and President Wilson, who remained in bed only to be wheeled out for movies and some fresh air, was virtually powerless. The question then is: who was Edith Bolling Wilson? Was she a woman singularly gifted enough to run the country and nurse her husband back to health? Or was she a woman doing the best she could in a world in which women were seen as little more than second-class citizens? Now, almost a hundred years later, we again ponder the impact of our first woman president. To do so, we must first go back to a train car outside of Pueblo, Colorado, in the Indian summer of 1919. It is here in the heat and dust on September 25 that Edith Wilson’s presidency began. 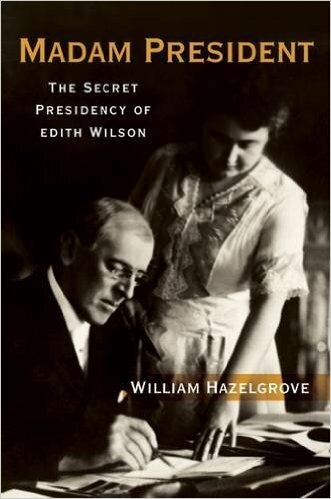 William Hazelgrove's "Madam President: The Secret Presidency of Edith Wilson" is a vivid, engaging portrait of the woman who became the acting President of the United States in 1919, months before women officially won the right to vote.